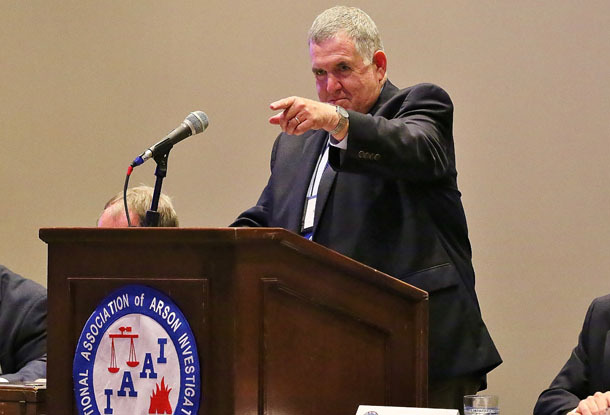 The International Association of Arson Investigators (IAAI) is extremely pleased to congratulate IAAI Life Member Steve Austin on being named a recipient of the 2018 CFSI/Motorola Solutions Mason Lankford Fire Service Leadership Award. This is one of the most prestigious awards in the fire service and there is no more worthy recipient than Mr. Austin. Steve Austin is a past recipient of the IAAI Distinguished Service Award. He has served IAAI and its members in many capacities, including as Governmental Affairs Director, Co-Chair of the Advocacy Committee, a contributing editor to Fire & Arson Investigator, representative to The Pro Board, representative to the NFPA 1033 technical committee, representative to CFSI's National Advisory Committee (as well as past chair), representative to the Assistance to Firefighters Grant Program for SAFER, and a member of the CFITrainer.Net® Steering Committee. Mr. Austin is also a Charter Member and Past President of the Delaware Chapter of IAAI. Since his retirement from State Farm after a long career, Mr. Austin has been anything but truly retired, as he has given his all to the fire investigation community, the fire service, and first responders as a whole through the many leadership positions he has held in organizations like the IAAI, the Congressional Fire Services Institute, and the Cumberland Valley Volunteer Firemen's Association. He has chaired and served on many influential committees, including the technical committees for multiple NFPA standards, most recently as the chair of the first edition of NFPA 1091: Standard for Traffic Control Incident Management Professional Qualifications. Mr. Austin is a founding member of the Emergency Responder Safety Institute and has dedicated many years to advancing the cause of safe operations on the roadway for the fire service, law enforcement, and other responder groups. He is a Past President of both the Delaware Volunteer Firefighter's Association and the Cumberland Valley Volunteer Firemen's Association. Mr. Austin was recently named Chairman of the Board of the First Responder Center for Excellence. He is also Chairman of the Delaware Volunteer Firefighter's Association Foundation. He is a member of Hiram Lodge, #25 AF & AM. "Steve is a perfect fit for this award," said Scott Bennett, President of IAAI. "Mason Lankford dedicated his life to making the fire service safer. Steve's work is directly in that tradition and his leadership and advocacy on issues such as fire investigation credentialing, third-party accreditation of training organizations, and safety in roadway incident operations have directly impacted the way everyone in the fire service, and especially fire investigators, trains and operates." IAAI would also like to extend its congratulations to the co-recipient of this year's award, Tony O'Neill, and wishes the Congressional Fire Services Institute well as they celebrate their awards this April at the 30th Annual National Fire and Emergency Services Symposium and Dinner. For more on the selection of this year's Mason Lankford Award recipients, please read the announcement on CFSI's website.